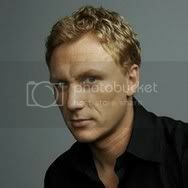 Episode directed by KEVIN MCKIDD. I loved the direction for this episode! Kevin can sustain a nice balance between the humor and the drama, something I think it hard to make look so effortless! I find it very telling that Meredith is "seething" with jealousy and trying to hide that fact, whereas Owen is fully and completely celebrating Cristina's achievement. I would LOVE to see Meredith's professional jealousy become an underlying factor for Cristina to leave the hospital. I don't think the story will take that route, but it would if I were writing it.